Ogni anno il 15 e 16 agosto il Castello Dal Verme di Zavattarello ritorna al suo storico passato: tra dame e cavalieri, artigiani e cortigiani, il giardino e le sale si animano di rievocazioni di battaglie, danze e giochi medievali, con numerosi intrattenimenti per i visitatori. I nemici tenteranno di assediare il castello: Pietro e i suoi dovranno mostrare tutto il loro valore per respingere l'assalto. A coronare l'evento, una cena medievale ai piedi del castello (la sera del 15 agosto alle ore 20) con menù dell'epoca e la compagnia dei figuranti in costume, che renderanno omaggio a Pietro e Chiara e ai loro ospiti con balli, musica, giocoleria, duelli. A seguire, alle ore 23.30, in Piazza Dal Verme lo spettacolo del fuoco "Sulle rotte del giullare" e i fuochi d'artificio. Durante le due giornate, servizio navetta gratuito da Piazza Dal Verme al Castello. Oppure potrete godervi una dolce passeggiata di 800m attraverso il borgo duecentesco fortificato "Su di dentro", recentemente restaurato. 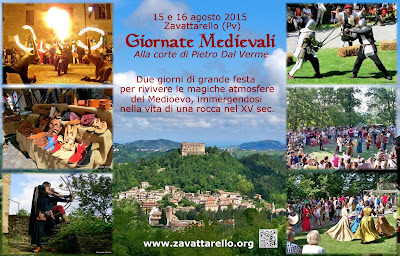 the Medieval Days of Zavattarello are back! Every year on 15th and 16th August the Dal Verme Castle comes back to its glorious past: with ladies, knights, artisans, courtsmen, the garden and the rooms are animated with battles, dances and games, with a lot of entertainments. Two days of feast to relive the magical athmospheres of the Medieval Ages, diving in the life of a fortress during the 15th century. 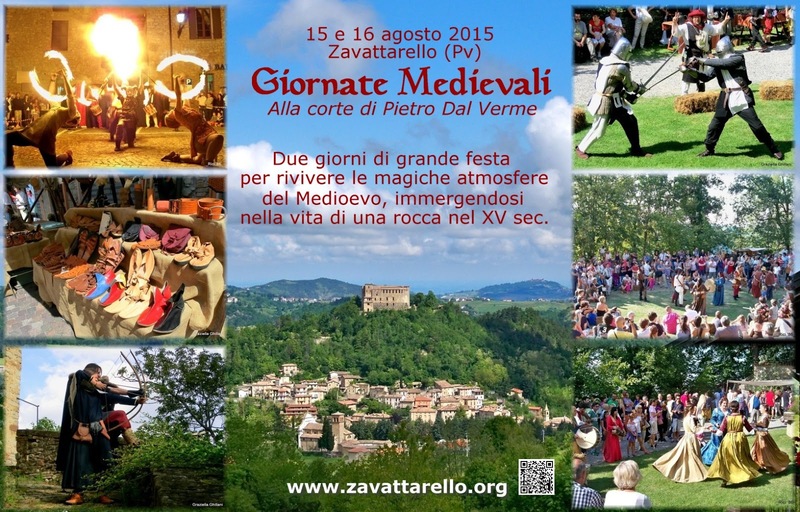 The Medieval Days of Zavattarello celebrate an event linked to the most famous person of this castle: Pietro dal Verme. These days celebrate the betrothal between him and Chiara Sforza. During all the event, Dal Verme Square will become a Medieval Market, where you can buy souvenirs, watch the artisans at work, try ancient games. The enemies will try to besiege the castle: Pietro and his men must show all their virtue to ward off the attack. To fulfil the event, the Medieval dinner at the foot of the castle (on 15th August at 8pm) with ancient dishes and the reenactors paying homage to Pietro and Chiara and their guests with dances, music, juggling, duels. At the end, at 11.30, in Dal Verme Square the Fire Juggling Show and fireworks. During all the event, free shuttle service from Dal Verme Square to the Castle. Or you can enjoy a light stroll (about 800m) through the 13th century fortified village, recently restored.